Is your heart broken, burdened, or self-condemning? Are you trudging along on a pathway of darkness, desolation, and despair? Then Holley Gerth‘s new book – What Your Heart Needs for the Hard Days: 52 Encouraging Truths to Hold On To – is written especially for you. In 52 truths using verses from the Psalms, hope spreads a soothing balm in our weary hearts as Holley invites us to lean into the faithful love of Jesus and embrace His love and compassion. These devotions can either be read daily or weekly or just when our heart needs a gentle reminder that we are loved, we still matter, and we are enough just as we are. God cares so much, He is still in control of our lives no matter what is happening, and His grace is sufficient to get us through anything. all of who I am, even my tears. as well as everything in between. The conclusion of each devotion is What My Heart Is Hearing from You with three lines for you to sum up what you feel God is saying to you in the Psalms suggested. Your heart will be inspired, uplifted, and strengthened when you read this book. Holley has a heart for hurting souls, and each of her books nurture hope, healing, and freedom in Jesus. Hi Trudy! I saw this book on Holley’s blog. Are you going to join in the book club with her? Thank you for the review, and it sure seems like this has touched a chord with you and Sherrey! Wow this sounds like a great book/devotional! I am reading Jesus Calling (a devotional) by Sarah Young daily and find it very good! The way that you describe how one can really make Holley’s devotions your own (by leaving room for readers to add in their own lines) sounds very helpful! Thanks for your review. 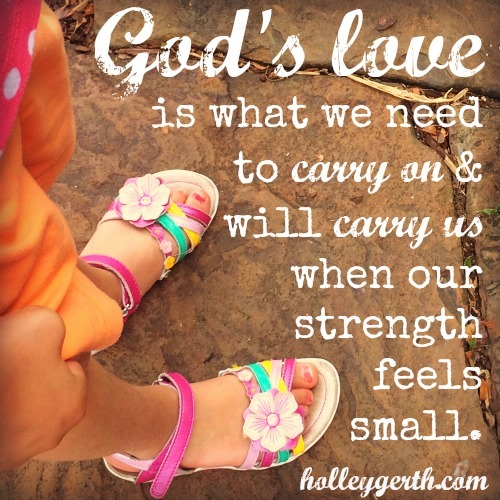 I just discovered this little gem called Holley Gerth. Loving her stuff. Thanks for this review. Saw your post on The Essential Thing Friday Linkup.